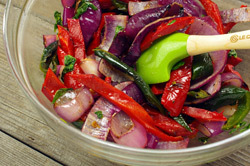 This straightforward preparation can serve as the foundation for any number of sauces or accompaniments, such as the fresh, colorful side dish featured below. 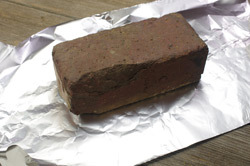 SPECIAL EQUIPMENT: A brick wrapped in foil or a cast-iron skillet wrapped in foil. 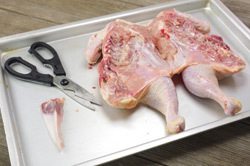 Open the chicken and place on a work surface, skin side up. Using your palms, firmly press on the breastbone to flatten the breast. 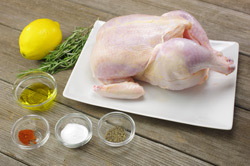 Season chicken all over with 1 Tbsp. salt, 1/2 tsp. black pepper, and cayenne. Place in a baking dish; rub with 1 Tbsp. 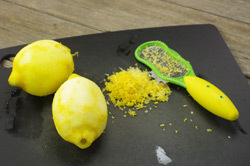 oil, sprinkle with lemon zest, and scatter rosemary over. Let stand at room temperature for 1 hour. Build a medium-low fire in a charcoal grill, or heat a gas grill to medium. 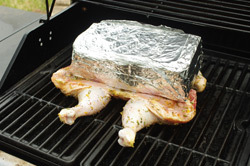 Brush grill grate with oil Place chicken, skin side down, on grill and place a foil-wrapped brick or heavy skillet on top of the chicken to weigh it down. Cook until skin is crispy and golden brown, about 15 minutes. Using tongs, set brick aside. 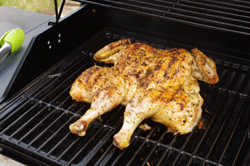 Turn chicken, cover grill, and cook for 10 more minutes. 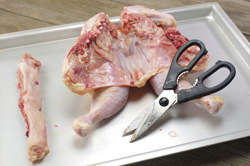 Continue cooking and turning chicken every 10 minutes, covering grill between turns, until an instant-read thermometer inserted into the thickest part of the thigh registers 165°F, about 50 minutes total. 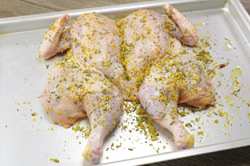 Transfer to a cutting board; let chicken rest for 10 minutes (resting will make for juicier meat). 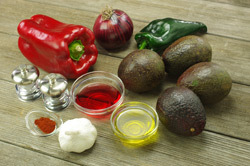 Serve with Grilled Avocados and Chiles (below). The interplay of charred poblano chile, bell pepper, and onion – combined with sautéed garlic and basil – make for a rich, flavorful accompaniment to Chicken Under a Brick. And for the record, you haven’t lived until you’ve eaten a grilled avocado. Build a medium fire in a charcoal grill, or heat a gas grill to medium-high. Brush grill grate with oil. 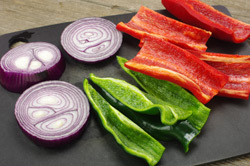 Season chile, bell pepper, and onion with salt and pepper. Grill, turning occasionally, until softened and charred in spots, about 12 minutes. Transfer onion to a medium bowl. 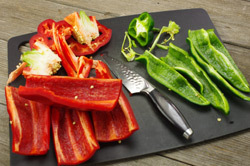 Transfer chiles and peppers to a work surface and cut lengthwise into 1-inch slices. Add to bowl with the onion. Add 1/4 cup vinegar and toss to coat. Heat 2 Tbsp. 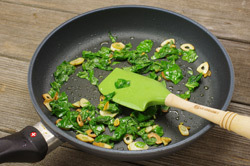 oil in a small skillet over medium-low heat. Add garlic and cook until soft but not browned, about 4 minutes. 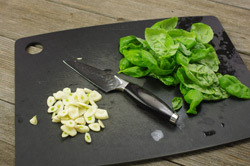 Add basil and stir to wilt. Transfer basil mixture to bowl with onion. Season vegetables to taste with salt and more vinegar, if desired. Rub cut side of avocados with remaining 1 Tbsp. oil, season with salt, and sprinkle with chili powder. 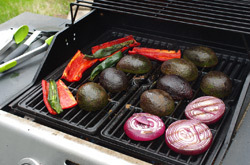 Grill, cut side down, until avocado is gently warmed and flesh is golden brown, about 3 minutes. 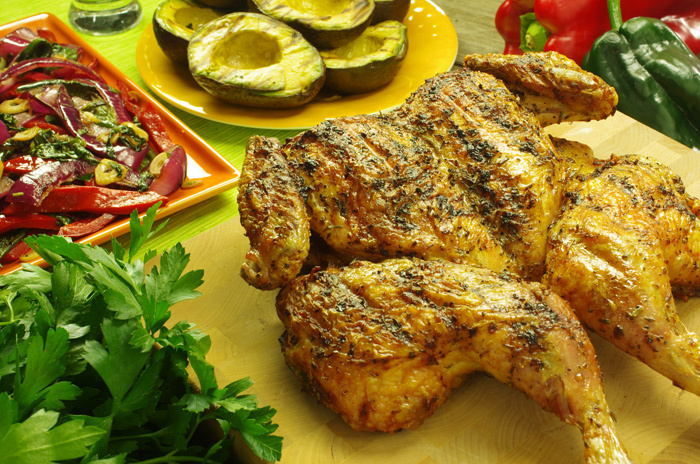 Serve with chicken and vegetables.